The Rover Environmental Monitoring Station (REMS) on NASA's Curiosity Mars rover includes temperature and humidity sensors mounted on the rover's mast. One of the REMS booms extends to the left from the mast in this view. Spain provided REMS to NASA's Mars Science Laboratory Project. The monitoring station has provided information about air pressure, relative humidity, air temperature, ground temperature, wind and ultraviolet radiation in all Martian seasons and at all times of day or night. This view is a detail from a January 2015 Curiosity self-portrait. The self-portrait, at http://photojournal.jpl.nasa.gov/catalog/PIA19142, was assembled from images taken by Curiosity's Mars Hand Lens Imager. The weather data in the report published today in Nature Geosciences come from the Cuirosity's Rover Environmental Monitoring Station (REMS), which was provided by Spain and includes a relative-humidity sensor and a ground-temperature sensor. 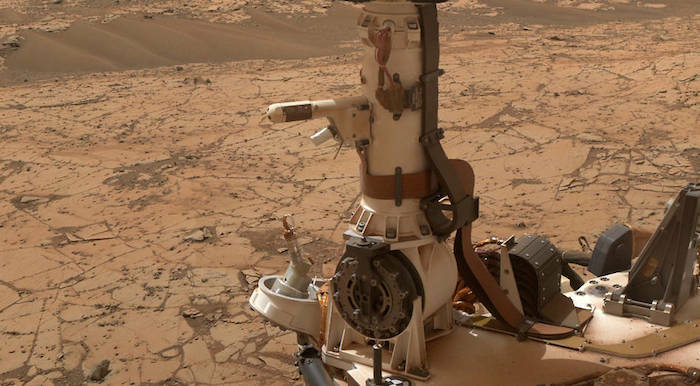 NASA's Mars Science Laboratory Project is using Curiosity to investigate both ancient and modern environmental conditions in Mars' Gale Crater region. The report also draws on measurements of hydrogen in the ground by the rover's Dynamic Albedo of Neutrons (DAN) instrument, from Russia. This view from the Navigation Camera (Navcam) on NASA's Curiosity Mars rover shows the terrain ahead of the rover as it makes its way westward through a valley called "Artist's Drive." The Navcam recorded the component images of this mosaic on April 10, 2015, during the 951st Martian Day, or sol, of Curiosity's work on Mars. The valley is on the rover's route toward a higher site on Mount Sharp than the "Pahrump Hills" area the mission investigated at the base of the layered mountain. NASA's Curiosity Mars rover used its Navigation Camera to capture this view on April 11, 2015, during passage through a valley called "Artist's Drive" on the route up Mount Sharp. The image appears three-dimensional when viewed through red-blue glasses with the red lens on the left.